By completing this exercise successfully you should be able to achieve all of the following. 1 Demonstrate an awareness of the ‘time-cost dilemma’ that underpins all development and renewal decisions. 3 Gain some insights into the nature of the Cost-Benefit-Analysis approach to option appraisal. By considering the practical issue of how best to deal with dilapidated buildings, we will explore how the principles of cost-benefit-analysis (CBA) can be applied to a complex decision-making problem that periodically faces property managers. Although the topic uses social housing as its focus, the principles discussed can apply to any managed property. The basic problem can be formulated as two inter-related ‘time-cost’ questions. Do we want to renew the building(s) in question to a high standard or a low standard or something in between? Is it worthwhile spending more now on the renewal in order to save costs later on? These two linked questions constitute a dilemma. We can call this the ‘time-cost dilemma’. We will now explore how theorists and practitioners seek to address this ‘time-cost dilemma’. With the dilemma in mind, we will identify and discuss the range of issues that have to be taken into account when deciding whether to redevelop or rehabilitate run-down properties. At its simplest, option appraisal can be thought of as a decision exercise that focuses on the problem of choosing between a number of courses of action within a specific, broad policy context. The object of the decision exercise is to make a ‘sustainable’ decision. We can think of a ‘sustainable’ decision as one that we don’t live to regret. Cost-benefit-analysis (CBA) is the over-arching context within which our option appraisal takes place. We therefore need to begin by summarising the principles of CBA. In so doing, we will confront some specialist terms that come from the field of welfare economics. These may be a bit off-putting at first. However, the ideas behind them are quite straightforward and not difficult to grasp. Once you understand the terminology and the ideas behind it, you will be in a position to move on and see how these concepts can be used in practice to help choose between options. Don’t lose sight of the fact that option appraisal is simply about making rational (i.e. ‘sustainable’) decisions by comparing the costs and benefits associated with the various options under consideration. Economic activity brings together valuable resources such as the skills and energy of the labour force, entrepreneurial talent, risk capital, land, raw materials, plant and machinery, in order to create an output of goods and services. We can call this output the social product. This product (or national output) is distributed partly through free enterprise markets (shops, etc.) and partly the state agencies (schools, hospitals, local government, etc.). Every increment of economic activity adds to the social product. When we build a new dwelling there is a marginal increase in the social product; when we renovate an old, run-down property there is a marginal increase in the social product, when a housing agency offers an improved aid and advice service to its tenants or to the general public there is a marginal increase in the social product, when an estate agent advertises a property there is a marginal increase in the social product, when a surveyor carries out a structural survey there is a marginal increase in the social product; and so on. Thus any particular economic activity can be said to produce an increment of output. We call this additional output the marginal social product (MSP). The word “marginal” indicates that it is an addition to the existing total, and the word “social” means that we are considering the additional output’s full benefit or utility to the community as a whole no matter to whom it accrues. For example, if we renovate a dilapidated building a number of people may be deemed to benefit in various ways. The beneficiaries could include the builders who earn an income from doing it up, the owner or investing agency who now possess a higher quality asset with a higher rental value, the occupier who may enjoy improved living conditions (over and above those paid for by any increase in rent), neighbouring householders whose property values have been enhanced as a result of the adjacent or nearby renovation, and others who when visiting the area now enjoy a more aesthetically pleasing general environment. Those who gain directly from the MSP (e.g. the builders, the landlord, and the tenants or occupiers of the improved dwellings) receive part of the extra product which we term the marginal net private product (MNPP). Those who gain indirectly from the renovation (e.g. people living in or travelling through the neighbourhood) enjoy part of the MSP we term the externality element (E). The term “externality” is used to indicate an interest that is external to those of the direct market or welfare participants. The direct ‘private’ interests (those who receive the MNPP) fall into two distinct categories. Firstly, those whose interests relate to the production/investment aspects of the economic activity (e.g. the builder and the landlord). Second, those whose interest relates to the consumption/utility aspects of the economic activity (the tenant or occupier). In other words, the MNPP is made up of two component parts. Where MNPPI = The net gain of the economic activity (e.g. a improvement or renovation) accruing to the builders and to the investing agency (e.g. a housing association, local authority or private landlord). 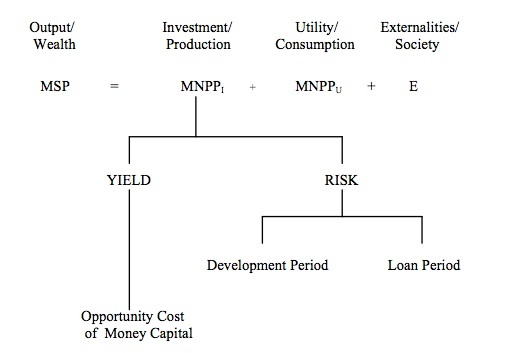 And MNPPU = The net gain or utility accruing to the final consumer (e.g. a tenant or other occupier). To avoid the problem of double counting we need to be clear that we are here referring to any extra utility over and above that accounted for by the increase in rental value that accrues to the landlord. Do not worry about this for the time being – it is explained below by reference to the concept of consumer surplus. For the time being, we can simply say that if a building is constructed or modernised, and as a result the occupier benefits in some way, we are calling this additional benefit the MNPPU. Where E = The net benefit accruing to the rest of society. Put simply, we can say: ‘when economic resources are utilised to increase the quantity or quality of the housing stock, additional real wealth is created (MSP), and this is distributed to the benefit of the investing agency and its suppliers (MNPPI), the final consumer (MNPPU), and possibly to the rest of society (E)’. The difference between a commercial appraisal and a CBA appraisal is largely a matter of scope. The underlying idea here is that of ‘opportunity cost’. Most opportunity costs decisions are concerned with how best to invest limited capital funds. Money capital is the money resources we have available to acquire real capital assets. Money capital can be acquired from reserves, loan funds, the sale of assets, grants, bequests and income flows. We assume that our money capital resources are limited and valuable. Deciding how ‘best’ to use them, therefore, is the key to sound investment decision-making. Once they have been used up on project ‘A’ these scarce resources are no longer available to be used on project ‘B’ which we were also considering. Economists regard this ‘lost opportunity’ to use the resources on something else we need or want as the true resource cost of going with ‘A’. This comparative way of thinking emphasises the importance of making the ‘correct’ choice about how to use limited resources such a money capital. This is why the idea of opportunity cost is at the heart of all option appraisals. The scope of an investment appraisal can be narrow or broad. A private firm may only be concerned with assessing a project from the point of view of its own narrow, commercial interests. That is, it will be concerned to assess the risks and yields that are related to the MNPPI. In strictly financial terms, it is concerned to appraise whether its money capital should be committed to this project or whether it would be ‘better’ invested in some other scheme. ‘Better’ in this context is assessed in relation to comparative risks and yields. In short, the private firm is narrowly concerned with the interests of its owners (e.g. shareholders): it is primarily concerned with the security and the opportunity cost of its money capital investment. For this reason, a straightforward, ‘narrow’ commercial appraisal may ignore the costs and benefits associated with the MNPPU and E, and limit its scope to those factors embraced by the MNPPI. Other organizations may wish to take a wider view. A housing association or local authority housing department, for example, may wish to consider the full consequences of a particular decision for its tenants: and a local authority planning department or a university research group may wish to consider the consequences of a decision for the local community. In such cases, the scope of the CBA study would have to be widened to embrace the MNPPU and /or E, as well as the MNPPI. The actual scope of a CBA study will be determined by its terms of reference: these in turn will be determined by the objectives of the commissioning agency. We will now look in some detail at how economic analysis can help to inform the decision about whether to redevelop or rehabilitate sub standard built assets. We must start, however, by emphasising the limitations to this ‘valuations’ approach to the appraisal problem. We are going to focus on a highly technical aspect of option appraisal. Because of this we need to make an important point at the outset. Cost-benefit analysis and other valuation techniques are only tools designed to help make good quality decisions. They do not give definitive answers, they merely provide information which can be taken into consideration by those faced with the problem of making a decision. Techniques like those we are about to consider should never be used mechanically; their function is simply to provide part of the necessary information. Their main contribution to the decision process is to take account of the fact that an appraisal has to give a present value to future costs and benefits. This is because we are making a decision now that will have cost and benefit consequences that come on stream in the future. In practice, whether or not a housing agency decides to redevelop or refurbish run-down dwellings will depend upon much more than a technical cost-appraisal calculation. Political, managerial or budgetary considerations may be much more important. For example, the decision may turn on the policy priorities of the agency, or on the current availability of money capital, or the desire to achieve a higher density land use, or to respond to a change in the regulatory framework (e.g. introduction of the Decent Homes Standard). It is vitally important that these real-world considerations are appreciated before giving consideration to the narrow and highly technical exercises that follow. For example, a narrow economic appraisal may indicate that, all other things being equal, it would pay the agency to postpone for a number of years the clearance and redevelopment of some run down properties, and in the meantime to renovate them up to a certain standard. However ‘all other things’ may not be equal. It may be that capital funds are available at the present which are unlikely to be available in a few years time, and for this reason the ‘best’ decision is to go ahead with immediate redevelopment. In other words, although postponement was the economically ration decision, it is overridden by matters of financial rationality. Similarly, wider managerial or political considerations may legitimately override an economic assessment. The key point is this: the purpose of the economic appraisal is not to make the decision, but to provide a particular type of information for the decision-makers to take into account, along with other information, in their deliberations about what course of action to take. It cannot be emphasised too strongly that the real decision-making only starts after the economic appraisal has been completed. The appraisal should be presented with the modest proposition that, for decision-makers, the more information they have, the more likely they are to make quality decisions. They may reject the economic conclusions, but they must do so knowingly. The general objective is to achieve the socially efficient balance between redevelopment and rehabilitation. Think Point: What is the difference between ‘social efficiency’ and ‘commercial efficiency’? To be commercially efficient the decision should be seen to be using scarce resources to optimise profits for shareholders (or other owners). To be socially efficient the decision should be seen to be using limited resources to optimise best value for stakeholders. The problem under consideration can be summarised as follows: ‘how can we tell which of the following alternative decisions gives us the best value for money?’ Or, to use the parlance of the current British Government, which constitutes the “best value” option? (b) demolish and rebuild some time in the future (in ‘n’ years time), and in the meantime refurbish and modernise. (i) The investing agency (MNPPI). (ii) The tenant occupiers (MNPPU). (iii) The rest of society (E). This is a rather intangible externality. We may assume that the external benefit to the rest of society consists of getting the housing stock up to some minimum normative standard. In this case, we may infer that since both renovated and newly built accommodation meet this requirement, society is indifferent about which type is made available. So, for the purposes of this exercise, E might be assumed to be zero and ignored. However, if this were not the case, and the terms of reference required us to take account of some externality factor of concern to society at large, then of course we would have to find a way of including it in the appraisal. The best way of dealing with this would be to treat the ‘extra benefit’ that the community at large might ‘enjoy’ by having brand new dwellings in the area rather than renovated ones, as a residual. This means that we would not spend any time trying to put a money figure on this rather intangible benefit at this stage. Instead, we would simply bear in mind that this benefit does exist, and bring it into the calculation at the end of the exercise. (This will be explained later). Think Point: Can you think of an externality benefit (i.e. something valued by society at large or the local community) that might result from opting for a more expensive redevelopment rather than a less expensive refurbishment? Such a benefit might arise when other parts of the locality have been, or are scheduled to be, substantially redeveloped. In such a case local people might feel that this new project should be up-graded so that it enhances and is in sympathy with the wider programme of development. You may have thought of some specific reasons why the local community might favour redevelopment over refurbishment. Some tower blocks in London, Birmingham and Glasgow have been demolished and redeveloped partly because they were difficult to let, but also because local people regarded them as aesthetically or socially unacceptable. Although it was technically possible to have brought them up to a ‘decent homes’ standard (and it would certainly have been cheaper), the local community and their elected representatives had come to associate them with negative social externalities such as crime and disorder. They were demolished and redeveloped (in part at least) in order to achieve these politically sensitive externality benefits. It may have occurred to you that in some instances externality factors can contribute to the favouring of refurbishment over redevelopment. The classic case would be a building that has some cultural significance. Some social housing trusts, for example, own dwellings that are of historic interest and because of this, society as a whole may be concerned that they are not demolished or substantially redeveloped. We will make the assumption that tenants will gain more utility (MNPPU) from occupying a new dwelling than from occupying a renovated one. Again, at this stage we do not try and put a specific value on this rather intangible benefit. In the exercise that follows, we will assume that the agency will be able to charge a higher rent for a new dwelling than for a renovated one. This higher rent is itself a reflection of the greater utility enjoyed by the tenant. It may be that we decide that the extra rent is an accurate measure of the additional utility: in which case, nothing more needs to be done. However, it may be that rent increases are controlled or modified (e.g. in order to achieve the government’s ‘rent restructuring’ policy objectives), and as a result, the tenant would in fact receive a marginal increase in utility that is of significantly greater value than the marginal increase in rent. In other words, the tenant would enjoy a ‘consumer surplus’¹ if we went ahead with the redevelopment. We may wish the appraisal to take account of the existence of this consumer surplus. Indeed, it might provide the agency with an opportunity to demonstrate that it is achieving ‘continuous improvement’ in its service delivery – which is a key objective of Best Value. If it is judged that such a consumer surplus exists, the best way of dealing with it would be again to treat it as a residual to be considered at the end of the exercise. That is, we do not spend time trying to calculate it as a precise figure, but simply put it to one side for the time being. Like other intangible benefits from redevelopment, it will come into the picture once we have done the cost calculation. (‘n’ years); the direct resource costs of redevelopment now compared with what they would be in ‘n’ years time; the difference in the annual maintenance costs of a refurbished as against a new dwelling over ‘n’ years; the difference in rental income over the same period; and the rate of interest (or discount rate). Other factors of a more intangible nature (like the consumer surplus a tenant gets from living in a new dwelling compared with a modernised one) are not directly accounted for in the formula. They are simply put to one side and treated as a ‘residual’ at the end of the exercise. This is explained below. Remember, the objective of the appraisal is simple: what is the most socially efficient decision?…..Demolish and rebuild straightaway, or refurbish for a period of ‘n’ years and then rebuild? The present value of the capital cost of redevelopment > the cost of renovating now + the present value of the cost of rebuilding in ‘n’years time + the present value of the difference in annual running costs and rentals for the same period. (All measured in real terms, i.e. at constant prices). You will notice that this exercise involves having to make a comparison between costs and rental income now and some time in the future (in ‘n’ years time). To make this comparison possible we have to give future costs and rents a present value. This process of “discounting” future values back to the present time is simply the reverse of the process of compounding interest forwards into the future. Therefore, we can regard the present value of a future sum as being that sum of money which, if lent now at a given rate of interest, would grow by a process of compounding, into that future sum. The exercise involves multiplying the sum in question x by (1+r)‾ⁿ or by simply looking the answer up in a standard valuation table. Some people find formulae a bit intimidating, so let us take the simplest possible example to show how it works. 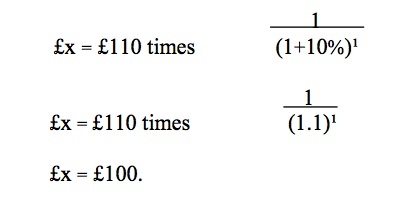 What is the present value of £110 in a year from now if the rate of interest (r) = 10%? 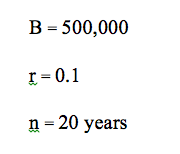 B = The direct cost of demolition, clearance and reconstruction (assume constant prices). M = The direct cost of modernisation (assumed to fall in the present year). n = Expected life of modernised dwelling. m = The annual extra maintenance costs that result from having a refurbished rather than a new dwelling. (Assume a constant figure and in constant prices). y = The annual loss of rent that results from having a refurbished rather than a new dwelling. (Assume constant). So, (m + y) = The new difference in annual costs in use and rent between a new and modernised dwelling. In other words, we assume that compared with a brand new building, a modernised one will cost more to maintain: this additional cost is a loss and = ‘m’. 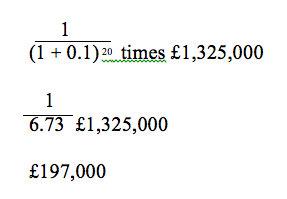 Also, compared with a new building, a refurbished property will generate less rental income: this loss = ‘y’. So, by postponing the redevelopment we will experience an annual cost charge of (m + y) for a period of ‘n’ years. 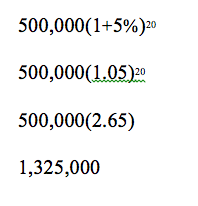 The formula shows what this total loss amounts to after ‘n’ years, discounted back to present value. Green, Green and Kirkwood³ suggest that such a formula can be used in two ways. Firstly, if all the values are known, a straight calculation can be made to indicate whether redevelopment or rehabilitation represents the more economic use of resources. 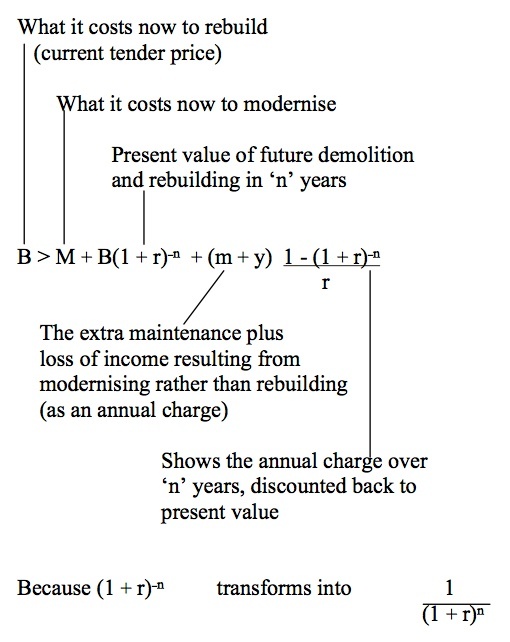 Alternatively, where a proposed scheme is in an early stage of evaluation and only tentative values are available, the formula can be used to show, for different rates of interest and values of ‘n’, the maximum percentage of the cost of redevelopment that could be spent upon rehabilitation in preference to redevelopment. In this example we will assume that we are in possession of all the information needed to make the economic appraisal. 1. Average tender price for a new build development = £500,000 (including site clearance). i.e. B = 500,000. 2. Current tender price for modernisation = £200,000. i.e. M = 200,000. 3. Difference in annual maintenance cost between new and renovated dwelling= £1,000. i.e. m = 1,000. And the difference between rental incomes = £5,000. i.e. y = 5,000. 4. Renovated property will have physical life of 15 years before requiring really major refurbishment or demolition. i.e. n = 15. 5. Discount rate / rate of interest = 10%. i.e. r = 0.1. Use the formula to indicate whether we should rebuild straightaway or rehabilitate and rebuild in 15 years time. This indicates that other things being equal, rehabilitation is preferred. Of course there is something missing from the calculation: namely, tenant consumer surplus (and other intangibles). You will remember that at the start of the exercise we made the assumption that tenants would enjoy a surplus of utility (over and above the extra rent charged) from living in a brand new dwelling than from living in a renovated one. We said that this extra utility was somewhat intangible, and rather than trying to measure it in money terms and include it in the formula, we would put it to one side to be considered at the end. There may be other intangible benefits from redevelopment compared with rehabilitation which we have also put to one side. Now is the time to bring the intangibles into the decision-making process. If it is decided that they are worth more than £134,840 then redevelopment becomes the most economic decision. Conversely, if they are worth less, then redevelopment remains the best decision. 1. What we did in this exercise is treat the occupier’s surplus utility as a ‘residual’, i.e. it was considered at the end of the calculation. This is because it is difficult to put a set money figure on such intangibles (it is very much a matter of judgement). Intangibles are easier to deal with in this way (i.e. as a residual). Of course, there may be other intangible advantages to going for new-build as against renovation. If this is the case, we simply ask a slightly different question at the end. Viz: ‘is the extra utility to the occupier plus all the other intangible advantages of having a new property rather than a renovated one, worth more than £134,840? If so, we should go for new-build. 3. 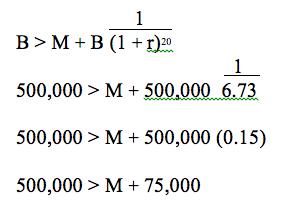 You should note that the result of an exercise like this is very sensitive to what discount rate is chosen. If your mathematics is up to it you can check this out by altering the rate used in the example and see what difference it makes to the decision. It is also sensitive to different values for ‘n’. This time we will assume that we are in the early stages of evaluation and we have only limited information available: namely current clearance and rebuild costs. At this early stage we want to get some general idea of how much it would be worth spending on rehabilitation before redevelopment becomes the more economically sensible decision. In other words, the problem can be summarised as follows. This time we are seeking to determine a critical value for rehabilitation (‘M’): up to how much we can spend on ‘M’ before ‘B’ becomes the preferred option? A redevelopment/rehabilitation cost ratio can be calculated from the formula. Ignore for the time being differences in running costs and rentals between a redeveloped and modernised unit, and also put to one side intangibles such as the extra utility an occupier obtains from living in a new as against a modernised dwelling. This indicates that, other things being equal (e.g. no building cost inflation) we can spend up to 425,000 (500,000 – 75,000) on modernisation before redevelopment becomes the more economic. (Assuming the modernised dwelling lasts 20 years and the rate of interest is 10%). Expressed as a percentage it means that it would be worthwhile spending up to 85% of the cost of redevelopment on rehabilitation. This redevelopment/rehabilitation cost ratio would then have to be adjusted to take account of any relevant intangibles or any estimated difference in running costs and rentals. It would also have to be adjusted to take account of future inflation. As it stands, the formula does not take account of building cost inflation. E.g. Let f = the rate of building cost inflation and r = the rate of interest. We can say that if f = r (and stays constant) then, if we put x aside now, it will be worth the present value of x in ‘n’ years time. 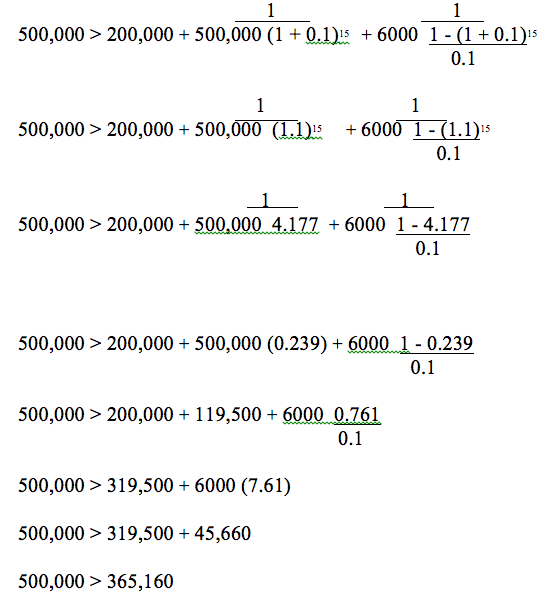 (This is what the above equation assumes). If, however, f < r then we can put less than x aside and still accumulate enough to pay for the redevelopment in ‘n’ years time. Conversely, if f > r we would need to put more than x aside in order to accumulate enough money capital to make possible the redevelopment in ‘n’ years time. This means that, as it stands, the equation ‘formulates the problem’ rather than ‘solves the problem’. In the above example, the £75,000 represents a figure which, if invested at 10% for 20 years, would accumulate to £500,000. The assumption is being made that by modernising rather than redeveloping, a saving of £75,000 is made, and this sum can be invested at the current rate of interest (assumed to be 10%), so that it can grow into a capital sum which will be available for redevelopment purposes at the end of the life of the modernised dwelling (assumed to be 20 years). Of course in 20 years time each unit will almost certainly cost more than £500,000 to redevelop. How much more will depend on the rate of inflation of development costs. We may therefore wish to make allowance for development inflation: that is, we may wish to provide for a capital sum in excess of £500,000. This indicates that it would be feasible to spend up to £303,000 on modernisation before redevelopment becomes more economic. The analyst can now ‘play about’ with different figures in the way of a simple sensitivity exercise. In this way he or she can explore the maximum cost of rehabilitation as a percentage of the cost of redevelopment when using different values for ‘r’, ‘n’, or development inflation. 1. Of course, the various formulae considered in this note can be modified in all sorts of ways to take account of other factors. With the help of computers, they could become very much more sophisticated and include a large number of variables. Our purpose, however, has been to lay down the basic principles of ‘technical evaluation’. 2. The CBA valuations we have considered should be thought of as no more than limited ‘techniques’. As such, any formula can only be a tool to help in the decision-making process. Like all cost-benefit exercises, the ones we have looked at should be treated as providing guidance rather than definitive answers. In many ways such techniques offer a rather crude and simplistic guide, and the formulae they offer should never be used mechanically. As we emphasised at the start, in the real world, ultimate decisions are made in relation to a complex of managerial, political, budgetary, social and economic considerations. A cost-benefit exercise provides just one part of the picture. The objective is always to provide some relevant information so that better informed decisions can be made. 1. What is the difference between a ‘commercial’ appraisal and a ‘social’ (CBA) appraisal of a project? 2.What are the limitations of a CBA/valuations appraisal? 3. What is meant by the ‘time value of money’? 4. Why is it suggested that intangible benefits and costs should be treated as a residual rather than given a money value straight away and directly incorporated into the calculation? 5. What are the different ways in which the Needleman formula might be used in practice? 6. What is meant by ‘sensitivity analysis’? Suppose that you rent a non-estate dwelling from a housing association. The association decides to do some improvements and then to redecorate the exterior. Because of this they decide to increase the rent. You are more than happy because you value the improvements more highly than the incremental increase in rent. Indicate whether the following consequences should be classified as MNPPI, MNPPU, or E.
(a) Your next door neighbour is an owner occupier, and as a result of the improvements to your dwelling, the exchange value of hers has increased slightly. (b) The extra value (utility) you gain from the improvements over and above the extra rent charge. (c) The extra rent income going to the association. (d) The extra satisfaction your mother and father get from visiting you in a “nice posh” dwelling. Write a paragraph which explains clearly the meaning of the phrase ‘the opportunity cost of money capital’. 1) If the rate of interest is 10%, what will £100 be worth in two year’s time? 2) If the rate of interest is 10%, what is the present value of 121 in two year’s time? 3) If the rate of interest is 9%, what will £80,400 be worth in five years time? 4) If the discount rate is 12%, what is the present value of £500,000 in six years time? Rework Example 1 in the text using a discount rate of 12%. Does the change in discount rate make a significant difference to the ‘decision’? Rework the Example again, this time leave the discount rate at 10% but change the estimated life of the renovated property to 25 years. Does this make a significant difference to the decision? You have now finished the topic material. Test your general understanding by answering the following questions. Q1. Summarise in your own words the nature of the ‘time-cost dilemma’ that sits at the heart of the issue we have been discussing. The dilemma is whether it is better to spend more money now and thereby reduce costs in the future or to spend less now and, as a result, have higher costs later on. Q2. We might summarise what we’ve done in this topic as a discussion about how to make ‘sustainable decisions’ about the renewal of dilapidated properties. How would you define a ‘sustainable decision’? Simply put, a sustainable decision is one that we don’t live to regret. a. The price charged for a particular good or service cannot be relied upon to represent a true measure of its total utility. b. What is needed is a measure of the amount that particular users of a good or service would be prepared to pay in order to secure themselves its advantages. c. The difference between that amount and the actual price charged equals “l’utilite relative”. Later, the eminent British economist, Alfred Marshall, referred to Dupuit’s concept of utilite relative as “consumer surplus”. (Alfred Marshall Principles of Economics, 1890). 2. Needleman L. The Economics of Housing, Staples Press, London, 1965. 3. D.Green, M.Green and J.Kirkwood, Redevelopment and Rehabilitation: The Economic Appraisal of Alternative Schemes, in ‘Housing Review’, July-September 1976, pp.90 to 93.